Now that I have a decent workflow for writing, coding would be the next good thing to reintegrate into my life. I get about an hour or two of discretionary time a day, late at night once A-‘s asleep. It’s not a solid chunk, since A- often wants to nurse, but I can usually get back to what I was doing without losing too much context. Sometimes A- takes a while to settle down, or wakes up midway. Sometimes I’m too sleepy to do much after A- goes to sleep. Still, I usually get a little time to update my journal, do some consulting, or even play video games with my husband. 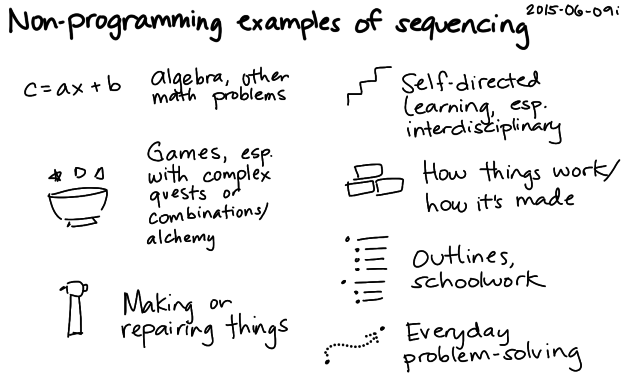 How does coding fit into the picture? It’s fun. I learn stuff. Sometimes I even build tools that make my life a little easier. It gives me non-baby things to talk about with W- and other people, too. The time needs to come from somewhere. What are the trade-offs I might make? Fewer drawings of non-journal thoughts, balanced by more writing time on phone. Can I figure out a good workflow for drawing on my phone? Not index cards, but maybe I can move my drawing practice to my phone for extra skill-building and mental variety. What could a good setup be like? 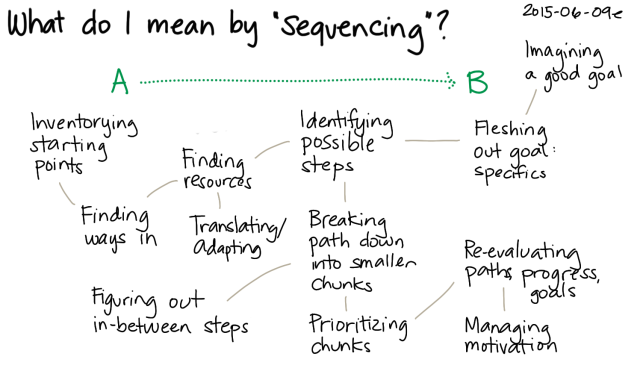 I spend some reading time going through documentation, Q&A, research, etc. 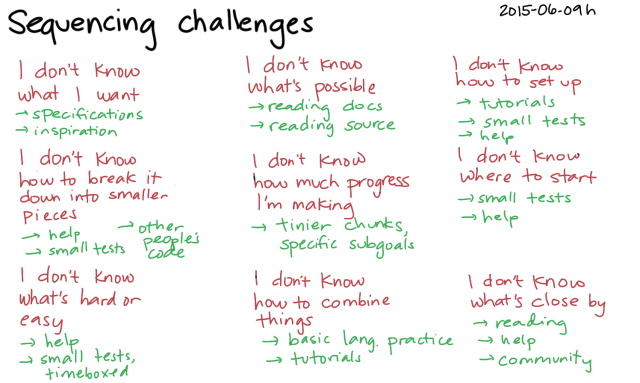 This helps me improve my skills and work more efficiently. I have a dev environment set up for risk-free experimentation. I have a to-do list with prioritized ideas and notes. I work on tasks that might be 15-30m in size, ideally with tests. I think it’ll be worth learning how to properly set things up with Vagrant. Frequent rebuilds will force me to make sure all my dev environment assumptions are documented. It’ll also be worth cleaning up my technical notes and writing more things down, so I can get back up to speed after months or even years away. 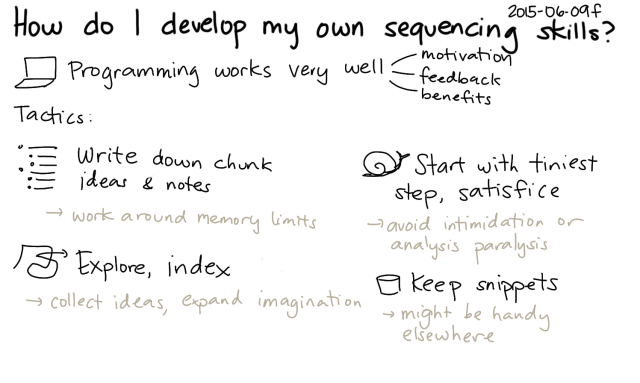 Then I’ll want to sort out my testing environment and get back to writing tests. I wonder if I can set things up so that I can even write tests on my phone. Maybe cucumber cases? It’ll be easier to write behaviour-driven tests than regular tests, since I don’t have to mess with punctuation. Then I can code, one small chunk at a time. Maybe I can even write pseudo code on my phone. I’d also like to get back to tweaking my environment and tools, since that pays off multiple ways for me: enjoyment, learning, efficiency, and notes to share. 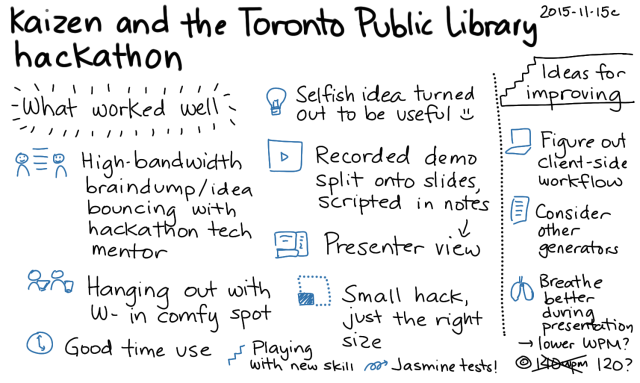 UPDATE 2015-11-30: Here’s the Toronto Public Library’s recap, along with other videos. UPDATE 2015-11-18: I figured out how to make this entirely client-side, so you don’t have to run a separate server. First, install either Tampermonkey (Chrome) or Greasemonkey (Firefox). Then install the user script insert-visualize-link.user.js , and the Visualize link should appear next to the library branch options on Toronto Public Library search result pages. See the Github repository for more details. Yay! 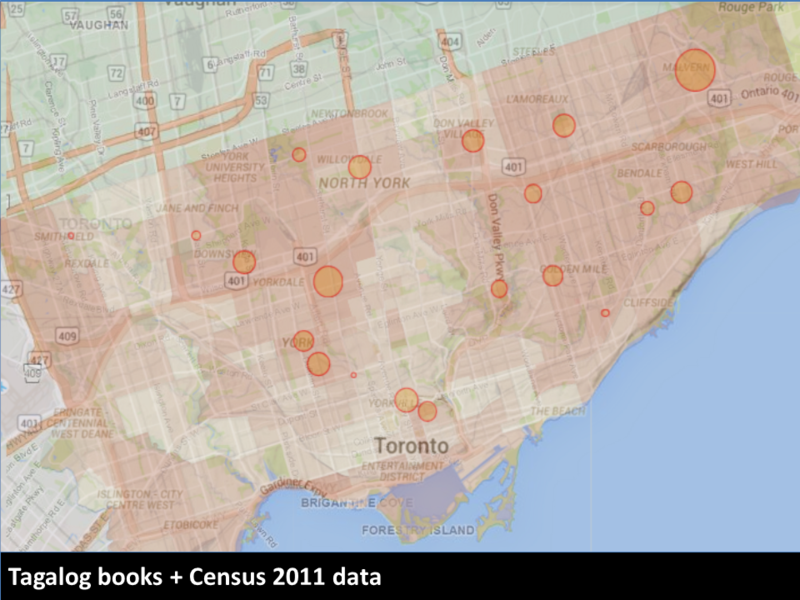 My neighbourhood library visualization won at the Toronto Public Library hackathon. It added a Visualize link to the search results page which mapped the number of search results by branch. For example, here’s a visualization of a search that shows items matching “Avengers comics“. It’s a handy way to see which branches you might want to go to so that you can browse through what’s there in person. Librarians could also use it to help them plan their selections, since it’s easy to see the distribution across branches. For example, here’s the visualization for books in Tagalog. 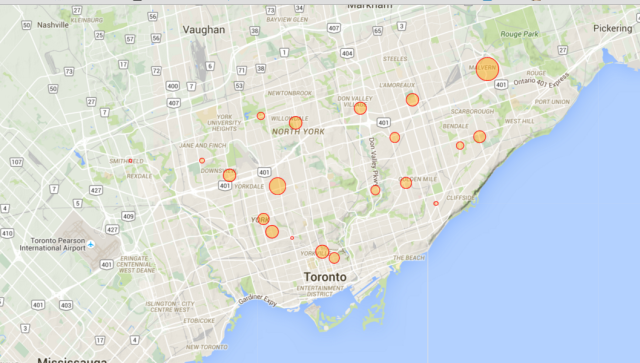 The collections roughly match up with Wellbeing Toronto‘s data on Tagalog as the home language, although there are some areas that could probably use collections of their own. Incidentally, I was delighted to learn that Von Totanes had done a detailed analysis of the library’s Filipino collections in the chapter he wrote in Filipinos in Canada: Disturbing Invisibility (Coloma, McElhinny, and Tungohan, 1992). Von sent me the chapter after I mentioned the hackathon on Facebook; yay people bumping into other people online! The code works by extracting the branch names and totals on the left side of search pages and combining those with the locations of the branches (KML). I don’t really need the server component, so I’m thinking of rewriting the script so that it runs entirely client-side – maybe as a Chrome extension or as a user script. That way, other people can play with the idea without running their own server (and without my having to keep a server around), and we can try it out without waiting for the library to integrate it into their website. That said, it would be totally awesome to get it into the interface of the Toronto Public Library! We’ll just have to see if it can happen. =) Happy to chat with library geeks to get this sorted out. It was fun working on this. W- decided to join me at the last minute, so it turned into a fun weekend of hanging out with my husband at the library. I wanted to keep my weekend flexible and low-key, so I decided not to go through the team matchmaking thing. W- found some comfy chairs in the corner of the area, I plugged in the long extension cord I brought, and we settled in. 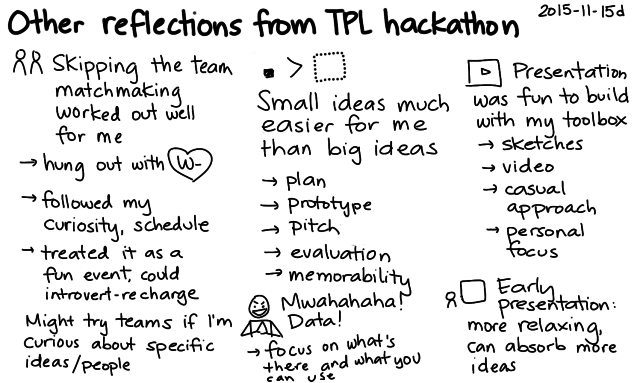 I learned a lot from the hackathon mentors. In particular, I picked up some excellent search and RSS tips from Alan Harnum. You can’t search with a blank query, but he showed me how you can start with a text string, narrow the results using the facets on the left side, and then remove the text string from the query in order to end up with a search that uses only the facets. He also showed me that the RSS feed had extra information that wasn’t in the HTML source and that it could be paginated with URL parameters. Most of the RSS feeds I’d explored in the past were nonpaginated subsets of the information presented on the websites, so it was great to learn about the possibilities I had overlooked. The faceted search was exactly what I needed to list recent videos even if I didn’t know what they were called, so I started thinking of fun tools that would make hunting for popular new videos easier. (There have been quite a few times when I’ve gone to a library at opening time so that I could snag a video that was marked as available the night before!) In addition to checking the specific item’s branch details to see where it was on the shelf and which copies were out on loan, I was also curious about whether we were checking the right library, or if other libraries were getting more new videos than our neighbourhood library was. W- was curious about the Z39.50 protocol that lets you query a library catalogue. I showed him the little bits I’d figured out last week using yaz-client from the yaz package, and he started digging into the protocol reference. He figured out how to get it to output XML (format xml) and how to search by different attributes. I’m looking forward to reading his notes on that. Me, I figured that there might be something interesting in the visualization of new videos and other items. I hadn’t played around a lot with geographic visualization, so it was a good excuse to pick up some skills. First, I needed to get the data into the right shape. I wrote a function to extract information from the branch CSV on the hackathon data page, using fast-csv to read it as an array of objects. I tested that with jasmine-node. Tiny, quick accomplishment. Then I worked on extracting the branch result count from the search results page. This was just a matter of finding the right section, extracting the text, and converting the numbers. I saved a sample results page to my project and used cheerio to parse it. I decided not to hook it up to live search results until I figured out the visualization aspect. No sense in hitting the library website repeatedly or dealing with network delays. I started with the Google Maps earthquake tutorial. The data I’d extracted had addresses but not coordinates. I tried using the Google geocoder, but with my rapid tests, I ran into rate limits pretty early. Then it occurred to me that with their interest in open data, the library was the sort of place that would probably have a file with branch coordinates in terms of latitude and longitude. 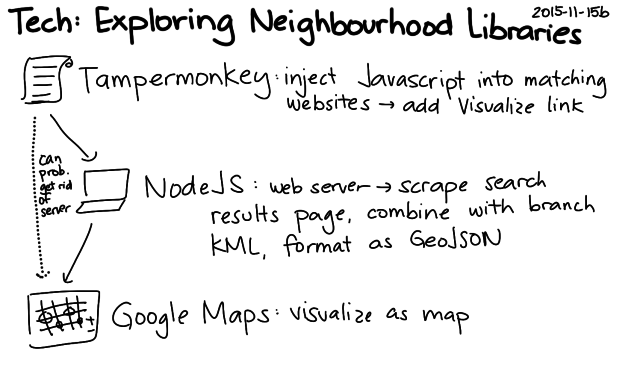 The hackathon data page didn’t list any obvious matches, but a search for Toronto Public Library KML (an extension I remembered from W-‘s explorations with GPS and OpenStreetMap) turned up the file I wanted. I wrote a test to make sure this worked as I expected. At first I tried to combine the data on the client side, making one request for the branch information and another request for the results information. It got a bit confusing, though – I need to get the hang of using require in a from-scratch webpage. I decided the easiest way to try my idea out was to just make the server combine the data and return the GeoJSON that the tutorial showed how to visualize. That way, my client-side HTML and JS could stay simple. Decisions, decisions… Red was too negative. Blue and green were hard to see. W- suggested orange, and that worked out well with Google Maps’ colours. Logarithmic scale or linear scale? Based on a maximum? 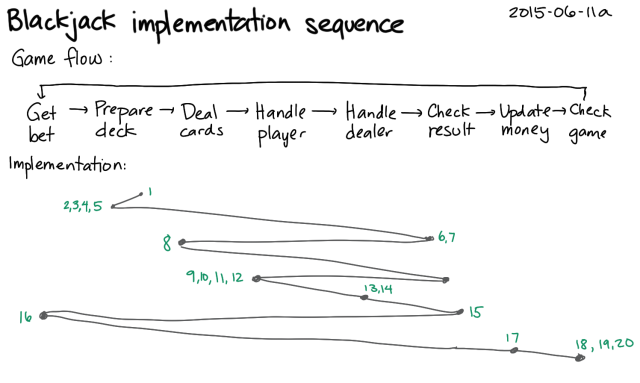 After experimenting with a bunch of options, I decided to go with a linear scale (calculated on the server), since it made sense for the marker for a branch with a thousand items to be significantly bigger than a branch with five hundred items. I played with this a bit until I came up with maximum and minimum sizes that made sense to me. I wanted to display information on hover and filter search results on click. Most of the tutorials I saw focused on how to add event listeners to individual markers, but I eventually found an example that showed how to add a listener to map.data and get the information from the event object. I also found out that you could add a title attribute and get a simple tooltip to display, which was great for confirming that I had the data all lined up properly. Testing with live data was a bit inconvenient because of occasional timeouts from the library website, so I decided to cache search results to the filesystem. I didn’t bother writing code for checking last modification time, since I knew it was just for demos and testing. The tooltip provided by title was a little bare, so I decided to spend some time figuring out how to make better information displays before taking screenshots for the presentation. I found an example that showed how to create and move an InfoWindow based on the event’s location instead of relying on marker information, so I used that to show the information with better formatting. Figure out the key message and the flow. Pick a target words-per-minute rate and come up with a word budget. Draft the script, checking it against my word budget. Read the script out loud a few times, checking for time, tone, and hard-to-say phrases. Annotate the script with notes on visual aids. Make visuals, take screenshots, etc. Record and edit short videos, splitting them up in Camtasia Studio by using markers so that I can control the pace of the video. Copy the script (or keywords) into the presenter’s notes. Test the script for time and flow, and revise as needed. I considered two options for the flow. I could start with the personal use case (looking for new videos) and then expand from there, tying it into the library’s wider goals. That would be close to how I developed it. 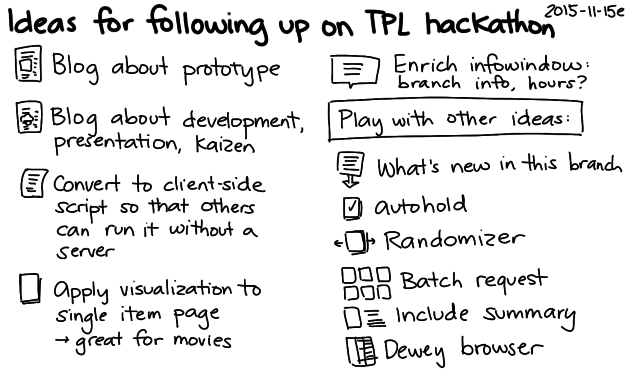 Or I could start with one of the hackathon challenges, establish that connection with the library’s goals, and then toss in my personal use case as a possibly amusing conclusion. After chatting about it with W- on the subway ride home from the library, I decided to start with the second approach. I figured that would make it easier for people to connect the dots in terms of relevance. I normally try to start with less material and then add details to fit the time. That way, I can easily adjust if I need to compress my talk, since I’ve added details in terms of priority. I initially had a hard time concisely expressing the problem statement and tying together the three examples I wanted to use, though. It took me a few tries to get things to fit into my word budget and flow in a way that made me happy. Anyway, once I sorted out the script, I came up with some ideas for the visuals. I didn’t want a lot of words on the screen, since it’s hard to read and listen at the same time. Doodles work well for me. I sketched a few images and created a simple sequence. I took screenshots for the key parts I wanted to demonstrate, just in case I didn’t get around to doing a live demo or recording video. That way, I didn’t have to worry about scrambling to finish my presentation. I could start with something simple but presentable, and then I could add more frills if I had time. Once the static slides were in place, I recorded and edited videos demonstrating the capabilities. Video is a nice way to give people a more real sense of how something works without risking as many technical issues as a live demo would. I had started with just my regular resolution (1366×768 on my laptop) and a regular browser window, but the resulting video was not as sharp as it could have been. Since the presentation template had 4:3 aspect ratio, I redid the video with 1024×768 resolution and a full-screen browser in order to minimize the need for resizing. I sped up boring parts of the video and added markers where I wanted to split it into slides. Camtasia Studio rendered the video into separate files based on my markers. I added the videos to individual slides, setting them to play automatically. I like the approach of splitting up videos onto separate slides because it allows me to narrate at my own pace instead of speeding up or slowing down to match the animation. I copied the segments of my script to the presenter notes for each slide, and I used Presenter View to run through it a few more times so that I could check whether the pace worked and whether the visuals made sense. Seemed all right, yay! Just in time, too. I had a quick lunch and headed off to the library for the conclusion of the hackathon. There wsa a bit of time before the presentations started. I talked to Alan again to show him what I’d made, hear about what he had been working on, and pick his brain to figure out which terms might resonate with the internal jargon of the library – little things, like what they call the people who decide what kinds of books should be in which libraries, or what they call the things that libraries lend. (Items? Resources? Items.) Based on his feedback, I edited my script to change “library administrators” to “selection committees”. I don’t know if it made a difference, but it was a good excuse to learn more about the language people used. I tested that the presentation displayed fine on the big screen, too. It turned out that the display was capable of widescreen input at a higher resolution than what I’d set, but 1024×768 was pretty safe and didn’t look too fuzzy, so I left it as it was. I used my presentation remote to flip through the slides while confirming that things looked okay from the back of the room (colours, size, important information not getting cut off by people’s heads, etc.). The hover text was a bit small, but it gave the general idea. And then it was presentation time. I was third, which was great because once I finished, I could focus on other people’s presentations and learn from their ideas. Based on W-‘s cellphone video, it looks like I remembered to use the microphone so that the library could record, and I remembered to look up from my presenter notes and gesture from time to time (hard when you’re hidden behind the podium, but we do what we can!). I stayed pretty close to my script, but I hope I kept the script conversational enough that it sounded more like me instead of a book. I didn’t have the mental bandwidth to keep an eye on the timer in the center of the presenter view, but fortunately the time worked out reasonably well. I concluded just as the organizer was getting up to nudge me along, and I’d managed to get to all the points I wanted to along the way. Whew! I scan my sketches or draw them on the computer, and then I upload these sketches to Flickr using photoSync, which synchronizes folders with albums. I include these sketches in my outlines and blog posts, and I update my index of blog posts every month. I recently added a tweak to make it possible for people to go from a blog post to its index entry, so it should be easier to see a post in context. I’ve been thinking about keeping an additional info index to manage blog posts and sketches, including unpublished ones. We’ll see how well that works. 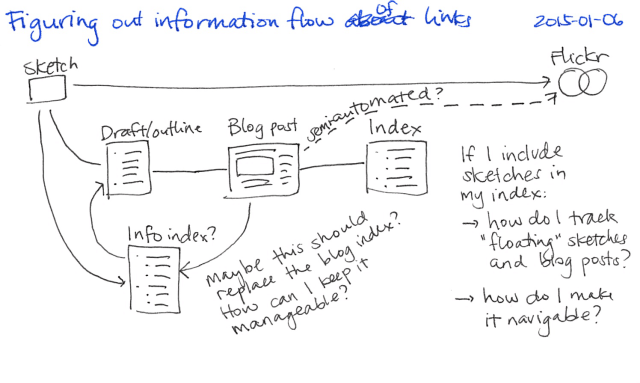 Lastly, I want to link my Flickr posts to my blog posts so that people can see the context of the sketch. My higher goal is to be able to easily see the open ideas that I haven’t summarized or linked to yet. There’s no shortage of new ideas, but it might be interesting to revisit old ones that had a chance to simmer a bit. I wrote a little about this in Learning from artists: Making studies of ideas. Let me flesh out what I want this archive to be like. 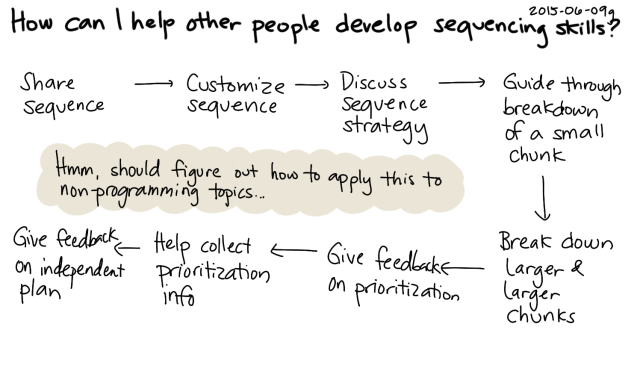 When I pull on an idea, I’d like to be able to see other open topics attached to it. 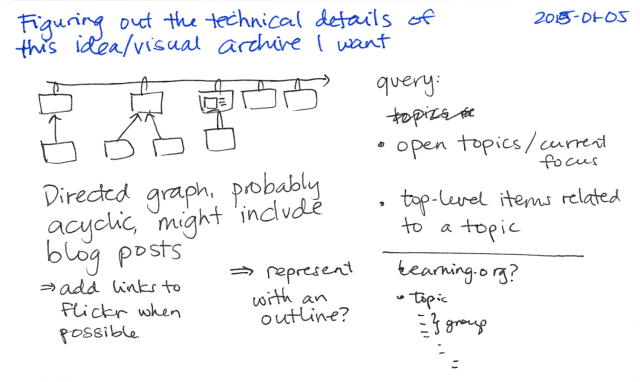 I also want to be able to see open topics that might jog my memory. How about the technical details? How can I organize my data so that I can get what I want from it? 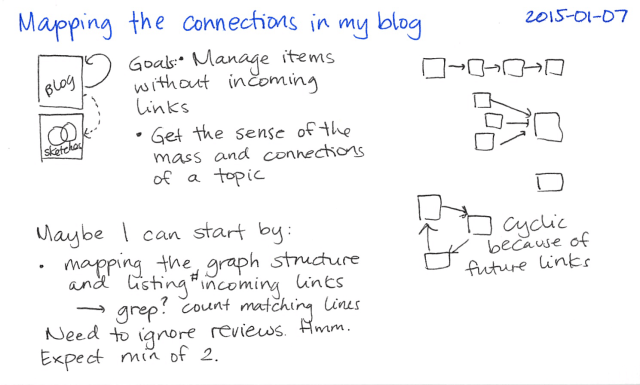 Because blog posts link to sketches and other blog posts, I can model this as a directed graph. 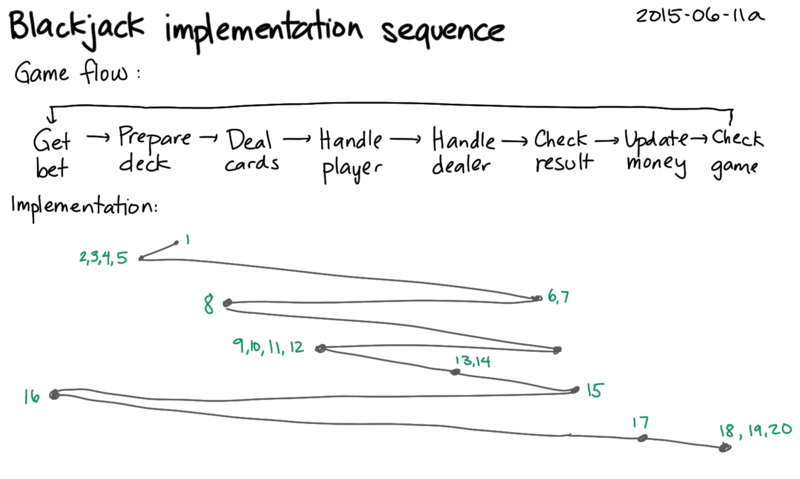 When I initially drew this, I thought I might be able to get away with an acyclic graph (no loops). However, since I habitually link to future posts (the time traveller’s problem! ), I can’t make that simplifying assumption. In addition, a single item might be linked from multiple things, so it’s not a simple tree (and therefore I can’t use an outline). I’ll probably start by extracting all the link information from my blog posts and then figuring out some kind of Org Mode-based way to update the graph. I couldn’t escape doing a bit of manual cleaning up, but I knew I could automate most of the fiddly bits. I installed node-flickrapi and cheerio (for HTML parsing), and started playing. You can see the code on Gist: duplicate_checker.js. I couldn’t easily automate this, but fortunately, the IFTTT script had only imported twenty images or so, clearly marked by a description that said: “via sacha chua :: living an awesome life…”. I searched for each image, deleting the low-res entry if a high-resolution image was already in the system and replacing the low-res entry if that was the only one there. This was the trickiest part, but also the most fun. I took advantage of the fact that WordPress transforms uploaded filenames in a mostly consistent way. I’d previously added a bulk view that displayed any number of blog posts with very little additional markup, and I modified the relevant code in my theme to make parsing easier. * Adds "Blogged" links to Flickr for images that don't yet have "Blogged" in their description. 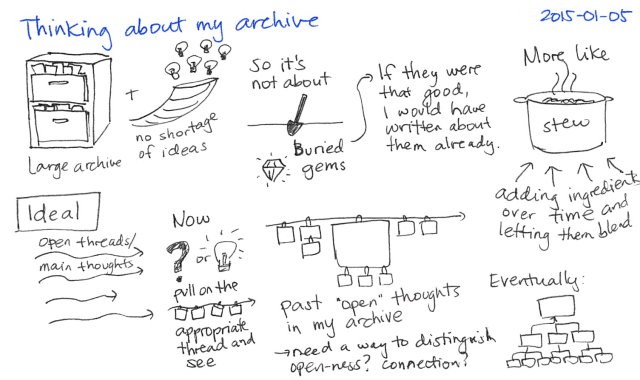 And now sketches like 2013-11-11 How to think about a book while reading it are now properly linked to their blog posts. Yay! Again, this script won’t get everything, but it gets a decent number automatically sorted out.